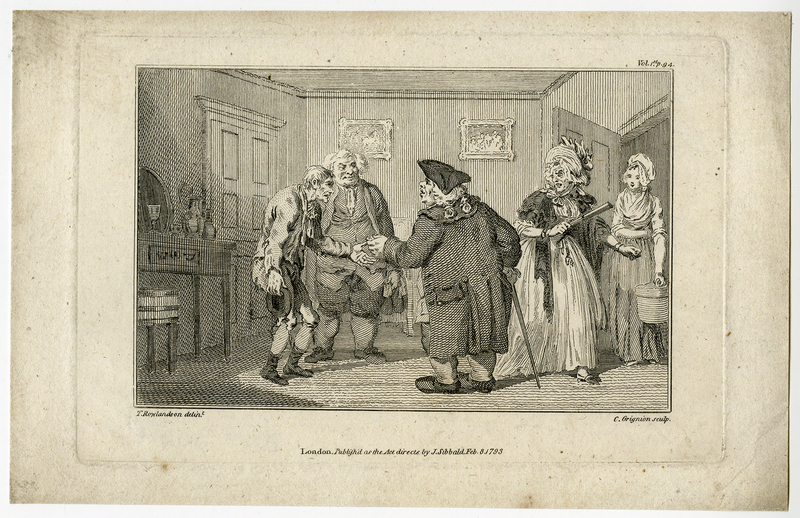 Subject: Print: Untitled print showing an 18th century English interior scene. A poor man on the left receives money from the man in the middle. A woman with a fan to the right seems to disagree with the proceedings. Condition: Good. General age related toning and light staining and/or soiling from handling. Please study scan carefully. Size (in cm): The overall size is ca. 22 x 14 cm. The image size is ca. 15 x 10 cm. Size (in inch): The overall size is ca. 8.7 x 5.5 inch. The image size is ca. 5.9 x 3.9 inch. Artists and Engravers: This plate engraved by C. Grignion after T. Rowlandson.